Image via Flickr, because I completely forgot to take a photo myself. Bonjour, kittens! Today, me myself and I, Tasha from Team BBI, is here to share a chicken recipe perfect for winter. It's rich, comforting, and tasty. You'll want to try it immediately, and you can thank me afterward. You're welcome. 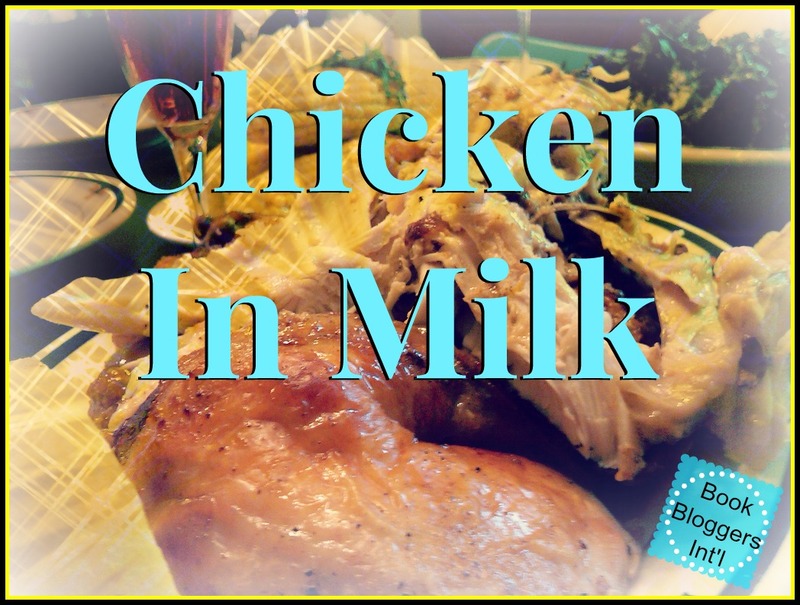 Say hello to your new favorite comfort food: Chicken in milk. I first ran across this strange-sounding recipe by accident, when I spotted a post titled, "Jamie Oliver's Chicken in Milk Is Probably the Best Chicken Recipe of All Time" at The Kitchn. The recipe is basically a whole chicken braised in milk. 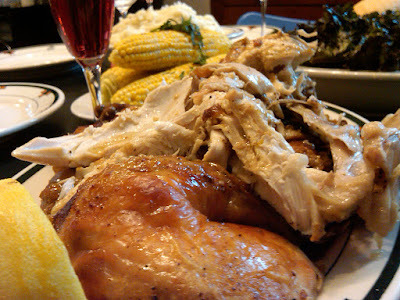 The Kitchn wasn't the only blog enthusiastic about the recipe: others called it the best chicken ever, the most tender roast chicken, and "amazing." So naturally I had to try it. As I was looking Oliver's recipe over, though, it reminded me of a similar recipe I'd seen on America's Test Kitchen, except this one was for milk braised pork loin. ATK had a few different techniques from Oliver's recipe, mainly to keep the milk from curdling. I hadn't tried ATK's recipe yet, but I decided to incorporate some of their tips in Oliver's basic recipe. Specifically, I didn't dump the fat out and used whole milk. Everything else was the same. The results were delicious! This recipe really is ridiculously easy, and leaving the fat in the pot left the sauce just slightly curdled. The picky eaters in my family didn't even notice it. But I kept thinking, what would have happened if I'd followed ATK's recipe more closely? Is their version superior to Oliver's? So I decided to make their milk braised pork roast as a comparison. Unfortunately, I was HUGELY disappointed in ATK's milk braised pork. The pork was extraordinarily bland and the sauce never thickened, despite the fact that I boiled it nearly 10x longer than the recipe called for. I did about double the work in this recipe as I did for Oliver's, and got only about a quarter of the flavor out of it. 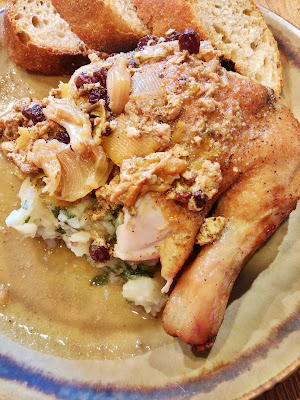 When I returned to Oliver's milk braised chicken, I wanted to see if I could get the smooth sauce ATK promised with all the flavor I'd previously had with Oliver's recipe. And I did! The sauce was rich and savory, with a ton of umami flavor, and the chicken was tender and moist. My family loved it. I think ATK tends to try to "solve" problems that aren't really problems, and the curdled sauce in these milk braises is a classic example of that. No, the sauce doesn't look pretty curdled, but it tastes DIVINE. There really isn't any good reason to do backflips just to make a smooth sauce when the curdled sauce tastes so effing good (unless you live in a house full of picky eaters you know will turn their nose up at such a thing, of course). That said, here's my recipe for chicken in milk with the smooth, uncurdled sauce. If this is a little too much work, just use whole milk and don't dump out the fat when you're making Oliver's original recipe. Definitely try either or both, though! Preheat oven to 375 degs F.
Rinse the chicken, pat dry, and season generously inside and out with salt and pepper. On the stovetop, heat the Dutch oven to medium-high heat. Melt butter. Brown chicken on all sides in the butter until golden. Remove from pot and set aside on a plate. Add milk, garlic, sage, baking soda, and cinnamon stick to pot. Stir and scrape up the brown bits on the bottom of the pot until the milk comes up to a boil, then lower heat to medium and keep stirring and scraping until milk has thickened slightly. Return chicken and any juices on the plate to the pot. Cover and cook in oven for 1 and half hours, flipping the chicken halfway through cooking. Once the chicken is cooked through, remove from pot and allow to rest under aluminum foil. Meanwhile, put the Dutch oven over medium-high heat on the stove and add the wine and lemon zest, whisking vigorously to smooth out the sauce. Bring to a boil and then simmer until sauce is the consistency of thin gravy. Once thick, remove pot from heat and add parsley, if using. Stir in any accumulated chicken juices and serve with with your favorite starch and veggie. Oliver says not to peel the garlic cloves, but I'm not a fan of finding garlic skins in my sauce, so I peel them before hand. I cover the pot while cooking, but if you like your chicken skin crispy, by all means leave the lid off and baste occasionally with the milk. First, I've rarely had an ATK failure, so I'm disappointed in the pork recipe too. And I'm glad you made this because now I'm curious and will have to give it a try. A whole stick of butter plus the fat from the chicken is a lot of fat! Must make it taste really rich. I did a similar recipe recently that used cider as the liquid -- also good. Tons of good ways to roast a chicken, no? Sounds good. Always looking for more chicken recipes. Thanks! I have pinned the chicken recipe, love your comments regarding the curdled sauce! December Food Fest: Do You Cookie Exchange?